The Mt W lottery opens on March 1 and ends on March 15. If you want to run you need to enter during this period (lottery by-pass or not). One of the Top Ten Male or Female Age-Graded Masters in last year's race. Have a continuous streak of official finishes since 1984. Selected for last year's race and cancelled in writing before June 1st. Anyone on our racing team should be able to get in as an Elite runner (if they haven’t already qualified via the by-pass). If in doubt contact Bob Teschek, worst case is that he will say “no” and you’ll have to enter the lottery. Don’t wait, do it today! 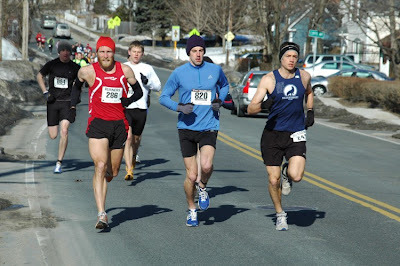 February 22, 2009 10 Miles (USATF Certified #MA90020WN) Amherst, Mass. Congratulations to CMS racing team members Tim Mahoney and Abby Woods....they were marrried last weekend. 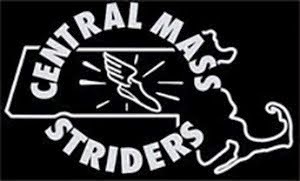 The CMS Men's Open team was out in full force this weekend all over New England, on the snow, roads, and track... as we creep closer to the DH Jones 10 Mile USATF-NE Championship this coming weekend out in Amherst, MA. Jim Johnson trailing leader Kevin Tilton with 400m to go at Sidehiller on the Sandwich Fairgrounds. Photo taken by Kristin Wainwright. "Danny died suddenly this morning of a heart attack. It is the way he would have wanted to go but of course a big shock to us all. I have all the family here so am very lucky. We will let you know the funeral arrangements etc. later. Perhaps you could let everyone know the news. 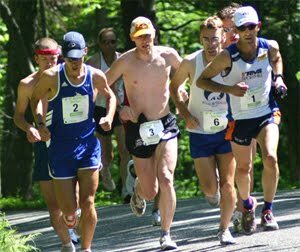 Danny was the President of the World Mountain Running Association and worked tirelessly to promote the sport. This past September after over a decade of trying, Danny finally succeded in getting the IAAF to recognize the World Mountain Running Trophy as an official "World Championship" race. He will be missed. DH Jones 10m – 02-22-09 Amherst, MA. $10,850 total prize money. $25 entry fee. Course record Bob Hodge 48:57. DH Jones was in the GP one other time (1999). This will be the 16th time that the Grand Prix (1985-2009) has had a 10 mile as part of the series. CMS has won the team championship 11 times; BAA and GBTC have both won twice. CMS also holds eight of the top 10 fastest team times. The team record, held by CMS, is 4:13:21 set in 1992. That is an impressive average of 50:40 for five runners. CMS put six runners in the top 10 that year. Wayne Jacob finished in 10th place in 51:30 and failed to score for the team! The last time CMS took the title was in 1998 (note: The 10 mile was not part of the Grand Prix from 2000-2006). CMS runners have been the individual winner three times. Scott Bagley won in 1988 and 1991 running 49:55 and 49:36. 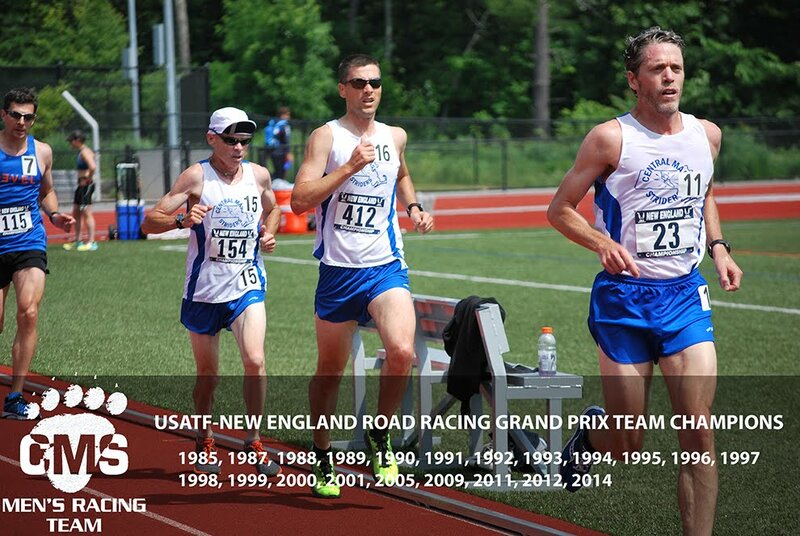 Craig Fram (who ran for CMS for a few years in the mid-90’s) was the New England champion in 1996 running 49:57, he finished third overall but the other runners were not USATF New England athletes. Additionally Dave Dunham (CMS 1992-present) won while representing GLRR in 1991 (49:36). Dave has also won twice at DH Jones when it was not part of the GP (1992 & 2001) running 50:36 and 55:04 respectively. Now if you are really into history. Here are the CMS results from the other GP 10 mile races from 1988-present. 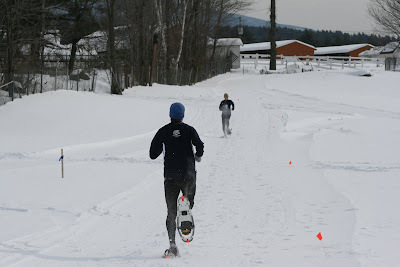 The acidotic racing team's website includes rankings of the top snowshoe racers in New England. They have a secret formula to determine the top runners. I have no formula, just my best guess on who would beat who if we all met in one race. I use all New England results and Eastern NY results as the E-NY races are part of the WMAC/Dion series and there is a fair amount of cross-over. Joe Shairs is front and center in the early miles at the Great Stew Chase in Lynn,MA. Ben Strain follows suit with Jim Pawlicki in tow.